By using an innovative ground-based analogue model, we are able to simulate a space mission including a trip to (0 g) and a stay on Mars (0.38 g) in rats. This model allows for a longitudinal assessment of the physiological changes occurring during the two hypo-gravitational stages of the mission. Mortreux, M., Riveros, D., Bouxsein, M. L., Rutkove, S. B. 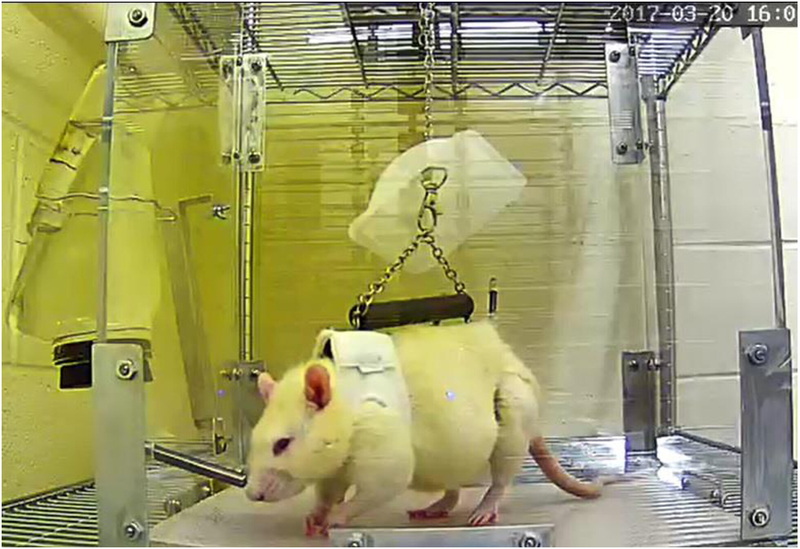 Mimicking a Space Mission to Mars Using Hindlimb Unloading and Partial Weight Bearing in Rats. J. Vis. Exp. (146), e59327, doi:10.3791/59327 (2019). Rodent ground-based models are widely used to understand the physiological consequences of space flight on the physiological system and have been routinely employed since 1979 and the development of hind limb unloading (HLU). However, the next steps in space exploration now include to travel to Mars where the gravity is 38% of Earth’s gravity. Since no human being has experienced this level of partial gravity, a sustainable ground-based model is necessary to investigate how the body, already impaired by the time spent in microgravity, would react to this partial load. Here, we used our innovative partial weight-bearing (PWB) model to mimic a short mission and stay on Mars to assess the physiological impairments in the hind limb muscles induced by two different levels of reduced gravity applied in sequential fashion. This could provide a safe, ground-based model to study the musculoskeletal adaptations to gravitational change and to establish effective countermeasures to preserve astronauts’ health and function. Extraterrestrial targets, including the Moon and Mars, represent the future of human space exploration, but both have considerably weaker gravity than Earth. While the consequences of weightlessness on the musculoskeletal system have been extensively studied in astronauts1,2,3,4,5 and in rodents6,7,8,9, the latter thanks to the well-established hindlimb unloading (HLU) model10, very little is known about the effects of partial gravity. Martian gravity is 38% of Earth’s and this planet has become the focus of long-term exploration11; hence, it is crucial to understand the muscular alterations that may occur in this setting. To do so, we developed a partial weight bearing (PWB) system in rats12, based on previous work done in mice6,13, which was validated using both muscle and bone outcomes. However, the exploration of Mars will be preceded by a prolonged period of microgravity, which was not addressed in our previously described model12. Therefore, in this study, we altered our model to mimic a trip to Mars, comprised of a first phase of total hindlimb unloading and immediately followed by a second phase of partial weight bearing at 40% of normal loading. Unlike most HLU models, we chose to use a pelvic harness (based on the one described by Chowdhury et al.9) rather than a tail suspension to improve animals’ comfort and to be able to move seamlessly and effortlessly from HLU to PWB in a matter of minutes. In conjunction, we used the cages and suspension devices that we previously developed and described extensively12. In addition to providing reliable/consistent data, we also previously demonstrated that the fixed attachment point of the suspension system at the center of the rod did not prevent the animals from moving, grooming, feeding, or drinking. In this article, we will describe how to unload the animals’ hind limbs (both totally and partially), verify their achieved gravity levels, as well as how to functionally assess the resulting muscular alterations using grip force and wet muscle mass. This model would be extremely useful for researchers seeking to investigate the consequences of partial gravity (either artificial or extra-terrestrial) on an already compromised musculoskeletal system, thus allowing them to investigate how organisms adapt to partial reloading, and for the development of countermeasures that could be developed to maintain health during and after human spaceflight. All methods described here were approved by the Institutional Animal Care and Use Committee (IACUC) of Beth Israel Deaconess Medical Center under protocol number 067-2016. NOTE: Male Wistar rats aged of 14 weeks at baseline (day 0) are used. Rats are housed individually in custom cages 24 h prior baseline to allow for acclimation. NOTE: The pelvic harness can be put on either anesthetized or awake animals. Here, the description of the protocol is given on anesthetized animals. Wear proper personal protective equipment (PPE) to handle animals. Place the rat in an anesthesia box with 3.5% isoflurane and an oxygen flow of 2 L/min. NOTE: Proper anesthetization is confirmed when a firm pinch of the rear paw does not elicit a reaction. Once the animal is fully anesthetized, place the rat on the bench with anesthetic gas coming from a nosecone with 2% isoflurane and an oxygen flow of 1.5 L/min. Place the rat in a prone position and put the pelvic harness on in a rostro-caudal movement. Gently bend the pelvic harness to provide a snug fit while being careful not squeeze the hindlimbs to prevent abrasions and discomfort. Attach the stainless steel chain with the swivel clasp to the top of the pelvic harness, where a hook is attached at the base of the tail. Remove the rat from anesthesia and place the animal in a custom cage with the chain extended at its maximum. Once the rat is fully awake and mobile, shorten the chain using the top swivel clasp until the hind limbs can no longer reach the floor. Observe the animal for a few minutes to assess its comfort and make sure that at all times, both hind limbs remain completely unloaded. NOTE: This step can be realized in both awake and anesthetized animals. Convert the HLU suspension device into a PWB suspension by adding the triangle-shaped part composed of stainless steel chains and a back rod. Anesthetize the animal following the same procedures as detailed for the HLU (steps 1.1 and 1.2). Place a tether jacket of the appropriate size on the forelimbs of the rat (M for rats of 400 g or lower, L for rats weighing above 400 g) and close it using the back bra extender. Attach one clasp of the triangle-shaped part to the hook located on the back bra extender and the opposite clasp on the hook located on the pelvic harness at the base of the tail. Allow the animal to recover from anesthesia in the cage. Once awake, verify that the suspension is equal on both the forelimbs and the hindlimbs by shortening the chain and modifying the location of the bottom swivel clasp if needed. NOTE: This step can also be realized using a force plate to confirm the equal loading on all limbs. Place the rat on top of the scale to record the “loaded” body weight, i.e., the weight of the animal and the entire apparatus, without shortening the chain. Shorten the chain until the scale displays 40% of the “loaded” body weight and record the achieved gravity level (expressed as the ratio between unloaded weight and loaded weight). Observe the animal to make sure that the unloaded weight is stable and that the rat is equally loaded on all limbs. Remove the entire apparatus from the scale using the rod and place the rat back in its cage. Hold the rat with a traditional restraint by placing one hand underneath the forelimbs. Gently hold the tail with the second hand. Approach the grip bar with the rear paws and make sure that both paws are fully resting on the bar. NOTE: If the rat does not fully grip the bar or does not display any evidence of voluntary gripping, slightly release the restraint. If this is unsuccessful, return the rat to its cage and retry after a few minutes. Gently pull the rat straight back until it releases its grip. Record the maximal force displayed on the transducer. Wait approximately 30 s between measurements and repeat the test 3 times. Calculate the average of the three measurements for scoring, to account for fatigue. Place the rat in a CO2 euthanasia chamber. After waiting the appropriate time according to IACUC and AVMA guidelines, confirm euthanasia by a visual observation of a lack of breathing. Place the rat on the dissection table in a prone position and remove the fur and skin by incising near the ankle using small dissection scissors. Use hands to pull the skin layer off. Using small dissection scissors, gently break the muscle fascia and isolate the calcaneus tendon. NOTE: The calcaneus tendon is the attachment point of both the soleus and the gastrocnemius muscles. While holding the calcaneus tendon with a small pair of tweezers, use the dissection scissors to isolate the gastrocnemius and soleus muscles from the biceps femoris, located above. Once isolated, cut the attachment point of the gastrocnemius and soleus muscles in the popliteal area. Gently pull the soleus away from the gastrocnemius and detach them by cutting the calcaneus tendon. Place the rat in a supine position. Carefully remove the fascia and peel the tibialis anterior from the ankle in an upward movement. Cut the tibialis anterior at its superior attachment point. Record the exact wet mass of each excised muscle using a tared precision scale and a weighing boat. Taking advantage of the new cages that we previously designed and described in detail12, we used a stainless steel chain-based suspension device that is suitable for both hindlimb unloading (HLU, Figure 1) and partial weight-bearing (PWB, Figure 2). The critical advantage of our design is the ability to go from one type of unloading to the other in a matter of minutes while maintaining an identical environment for the animals. We used a custom-made pelvic harness (Figure 2A) that is attached to a single custom-made stainless steel chain with a swivel clasp on each side for HLU. In order to modify this suspension device and achieve PWB, the addition of one triangle-shaped piece of stainless steel chain that incorporated an inflexible back rod, designed to sit just above the spine (Figure 3) is the only requirement. These steps can be performed in awake or anesthetized animals. With the versatile environment provided in this experiment, we could successfully unload the hindlimb of all of our animals for 7 days without any complications and quickly expose them to a partial gravity at 40% of their normal loading (PWB40, average achieved gravity level of 0.4076 g ± 0.0036 g). During the first week of total HLU, animals displayed a significant body weight loss (Figure 4A: -7.19% ± 0.87%, n = 9, p < 0.001), which has been witnessed in other models14, and does not differ significantly from what we observed in rats exposed at PWB40 for the same duration (-5.53% ± 1.44%, n = 10, p = 0.37). However, animals continued losing weight over time while subsequently being exposed to PWB40 (-9.06% ± 1.35% from baseline, p < 0.0001). Hindlimb grip force is a standard measurement of muscle function that can be used longitudinally (Figure 4B). We noticed that one week of total unloading led to an average decrease in grip force of 50.16% ± 4.10% compared to baseline (p < 0.0001). After one subsequent week of partial weight bearing at 40% of normal loading, we did not notice any further change regarding grip force (-44.29% ± 4.67% compared to baseline, p < 0.0001). At all time-points, the percent change in rear paw grip force was significantly different from the age-matched controls (p < 0.0001 for both day 7 and day 14, n = 11). Additionally, we observed that after completion of the study, animals that underwent total unloading followed by partial weight bearing (HLU-PWB40) displayed a significantly greater grip force loss compared to the PWB40 group (p = 0.03). Muscle wet mass was recorded at the end of the experiment and compared to data obtained after either two weeks of normal loading or two weeks of PWB40 (Figure 4C) and data previously published by our group12. We found that the PWB40 and HLU-PWB40 groups have significantly lower wet mass of soleus (S), gastrocnemius (G), and tibialis anterior (TA) muscles than age-matched controls (PWB100). Indeed, we recorded an average soleus mass of 0.1681 g ± 0.007 g for our animals which was significantly lower than the rats exposed to PWB100 for 2 weeks in our previous experiments (-24.60% ± 3.18%, p < 0.0001). For the gastrocnemius, we recorded an average wet mass of 2.192 g ± 0.096 g (-10.55% ± 3.93%, p = 0.038 vs PWB100) and a wet mass of 0.759 g ± 0.029 g for the tibialis anterior (-14.40% ± 3.27%, p = 0.009 vs PWB100). While our data set highlighted that the animals exposed to a Mars-mission analogue (HLU-PWB100) had a decreased wet mass of the soleus and gastrocnemius muscles compared to the animals exposed to PWB40 for 2 continuous weeks (-8.75% ± 3.84% and -5.85% ± 4.14%, respectively), we did not observe a significant difference between these two groups. Figure 1: Description of the suspension devices and how to convert from HLU to PWB. (A) Based on our previous design, we used an aluminum rod sitting on top of the cage to hold a steady suspension device composed of a key ring secured at the center of the rod (arrow 1), a stainless steel chain (arrow 2), and two swivel clasps (arrows 3). (B) To convert the suspension device to achieve PWB, a triangle-shape structure is attached using the bottom swivel clasp. This piece is composed of stainless steel chains and a polyvinyl chloride (PVC) back rod that sits above the rat’s spine (arrow 1). On each side of the back rod is located a clasp to attach to the harness and the jacket, respectively (arrow 2). Please click here to view a larger version of this figure. Figure 2: Hind limb unloading using a pelvic harness. (A) Front and side view drawings of the harness structure used to support the hind limbs of the animals. (B) The pelvic harness was positioned as described to fit snuggly around the hind limbs of the rat. The stainless steel link is positioned over the base of the tail and attached to the swivel clasp. The exact location and shape of the harness can vary between animals but rats should be comfortable and it is necessary that their hind limbs never touch the ground. Please click here to view a larger version of this figure. Figure 3: Partial weight bearing. The partial unloading requires the addition of a jacket to the animal in order to support the front limbs. The jacket is then closed with a back bra extender and a hook is attached to the extender, lying between the scapulae. Both the jacket and the pelvic harness are attached to clasps located on each end of the back rod. Please click here to view a larger version of this figure. Figure 4: Examples of longitudinal follow-up in animals exposed to different unloading levels. (A) Body weight (BW) change. Animals were weighed weekly without the harness or jackets and body weight was recorded. PWB100 = Partial weight bearing at normal loading; PWB40 = Partial weight bearing at 40% of normal loading; HLU-PWB40 = One week of hindlimb unloading followed by one week of PWB40. The results of Tukey’s post hoc test following a 2-way stacked ANOVA are presented as *: p < 0.05, **: p < 0.01, ***: p < 0.001, and ****: p < 0.0001 vs PWB100. (B) Change in rear paw grip force. Weekly, rear paw grip force was measured and results were expressed in percent change from baseline for each animal. The results of Tukey’s post hoc test following a 2-way stacked ANOVA are presented as ***: p < 0.001 and ****: p < 0.0001 vs PWB100, α: p < 0.05 vs PWB40. (C) Muscle wet mass after 14 days. Muscle wet mass was recorded on a precision scale immediately after sacrifice at 14 days. Results are presented as percent of the wet mass obtained in the age-matched control group (PWB100). S= Soleus; G= Gastrocnemius; TA = Tibialis anterior. The results of Tukey’s post hoc test following a one-way ANOVA are presented as *: p < 0.05, **: p < 0.01, and ****: p < 0.0001 vs PWB100. Please click here to view a larger version of this figure. This model presents the first ground-based analogue developed to investigate successive mechanical unloading levels and aims to mimic a trip to and stay on Mars. Many steps of this protocol are critical to ensure its success and need to be closely examined. First, it is crucial to monitor the wellbeing of the animals and ensure that they are maintaining a normal behavior (i.e., performing tasks such as eating, resting, and exploring), particularly during the PWB state where they maintain a relatively normal physiological posture. Second, despite the level of PWB being extremely steady over time and requiring minimal human intervention12,14, it is essential to record the achieved partial gravity to minimize variations amongst animals. Additionally, when animals are transitioned from total mechanical unloading to partial gravity (PWB40), they already display substantial muscle atrophy and loss of function6,9,15, which may cause transient difficulties in resuming quadrupedal weight-bearing behavior and lead to a momentary awkward gait. Due to the variable environment, several problems can arise and should be closely recorded and addressed. For example, a fluid shift occurs during the HLU period due to the slanted position of the animal, while it is not present during PWB16. In some cases, fluid redistribution can cause subtle edema most noticeable in the face or the rear paws, and usually disappears in the hours following reloading. We advise investigators to score the severity of the edema and assess it daily. If severe edema persists for greater than 48 h, animals should be excluded from the experiment. While the use of a pelvic harness provides comfort to the animals and increased convenience to the investigator, some animals may, occasionally, either totally or partially escape from their harness during HLU or PWB. We followed the exclusion protocol based on the previous work in mice6 in which any animal that escapes three times is removed from the study. As a side note, escapes are extremely rare; in our work less than 1% of animals had to be excluded over a 1-year period (1 animal out of 148 animals studied). The daily titration of the PWB level is a crucial moment where the experimenter can ensure the snug fit of both the jacket and the pelvic harness, therefore minimizing the risk of escape. While assessing animals’ weight and wellbeing daily, special consideration should be put in the maintenance of the pelvic harness. While site-specific hair-loss is the most common consequence, abrasion can appear if the pelvic harness is damaged (i.e., chewed). We advise researchers to check daily the harness condition and replace components when damaged or the entire harness when needed to prevent the appearance of skin abrasion. Wellbeing should at least include the following steps: monitoring of body weight, porphyria, food intake, presence of urine and feces, hair loss, skin abrasion, edema. The animals’ claws can also occasionally become entrapped in the hook-and-loop fastener or cloth, therefore compromising their balance. A simple and efficient way to prevent this from happening is to gently trim the claws under anesthesia before placing the jacket. This step can be repeated when needed during the course of study. Special attention needs to be paid during the transition from HLU to PWB. While we observed that all animals are able to walk with little difficulty immediately after being placed in PWB, the amount of time required to put the same amount of weight on both the front and the hind limbs varied among rats. If a rat does not demonstrate relatively normal gait using all limbs in 24 h, we recommend it should be excluded from the study. This novel model designed to mimic sequential gravitational environments is reliable and sustainable over time. However, some limitations exist and are yet to be addressed. First, this combination of models is only designed to assess the alterations occurring in the hind limbs of the animals as the HLU model only creates artificial microgravity on the rear limbs. Therefore, this ground-based sequential HLU-PWB analogue is not suitable to investigate fore limbs alterations. Secondly, over the 14-day period, our animals displayed a continuous but non-life-threatening loss of whole-body mass highlighting the complex readjustment of the rats to partial unloading (Figure 4A). In our previous PWB rat model study, the animals exposed at PWB40 and PWB20 for two weeks presented a significant loss over only the first 7 days and regained weight subsequently12. This was likely due to the fact that the rats were able to adjust to the quadrupedal unloading after an initial period of adaptation. However, in this study, the rats never fully adapted to the two different unloading/partial-reloading periods of one week each, likely explaining the sustained weight loss. It would be important to further extend these periods of full and partial-unloading to confirm that animals can fully adapt and settle into each environment. Stress levels have not been evaluated in this model yet and could easily be monitored in the future using regular blood sampling using the tail that remains entirely accessible. Our longitudinal assessments of muscle function and muscle mass showed that one week of hindlimb unloading caused a tremendous decrease in rear paw grip force (Figure 4B) with one of our rats exhibiting a 70% reduction in grip force. Unsurprisingly, after 14 days, animals displayed a significantly lower grip force than animals that had been exposed to 14 days of PWB40 in our previous study12 Whereas the average wet mass of the hindlimb muscles did not differ significantly between the PWB40 and HLU-PWB40 groups, we were able to establish a strong linear correlation among our 3 groups (PWB100, PWB40, and HLU+PWB40) regarding the average soleus mass (R2 = 0.92, p < 0.0001). These results confirm that partial loading following a total mechanical unloading compromises muscle health more than what would be observed during a continuous but stable period of partial unloading. Until now, this gap in knowledge has not been investigated. Further assessment of this phenomenon should be pursued in order to develop effective countermeasures preventing muscle deconditioning in the context of a mission to the Moon or Mars. The strength of our model also resides in its versatility as it allows for a variety of different experiments with several degrees of unloading and for varying lengths of time. This work was supported by the National Aeronautics and Space Administration (NASA: NNX16AL36G). Authors would like to thank Carson Semple for providing the drawings included in this manuscript. Desplanches, D. Structural and Functional Adaptations of Skeletal Muscle to Weightlessness. International Journal of Sports Medicine. 18, (S4), S259-S264 (1997). Fitts, R. H., Riley, D. R., Wildrick, J. J. Physiology of a microgravity environment : Invited review : microgravity and skeletal muscle. Journal of Applied Physiology. 89, 823-839 (2000). Fitts, R. H., Riley, D. R., Widrick, J. J. Functional and structural adaptations of skeletal muscle to microgravity. The Journal of Experimental Biology. 204, (Pt 18), 3201-3208 (2001). Narici, M. V., De Boer, M. D. Disuse of the musculo-skeletal system in space and on earth. European Journal of Applied Physiology. 111, (3), 403-420 (2011). di Prampero, P. E., Narici, M. V. Muscles in microgravity: from fibres to human motion. Journal of Biomechanics. 36, (3), 403-412 (2003). Wagner, E. B., Granzella, N. P., Saito, H., Newman, D. J., Young, L. R., Bouxsein, M. L. Partial weight suspension: a novel murine model for investigating adaptation to reduced musculoskeletal loading. Journal of Applied Physiology (Bethesda, Md. : 1985). 109, (2), 350-357 (2010). Sung, M., et al. Spaceflight and hind limb unloading induce similar changes in electrical impedance characteristics of mouse gastrocnemius muscle. Journal of Musculoskeletal and Neuronal Interactions. 13, (4), 405-411 (2013). Mcdonald, K. S., Blaser, C. A., Fitts, R. H. Force-velocity and power characteristics of rat soleus muscle fibers after hindlimb suspension. Journal of Applied Physiology. 77, (4), 1609-1616 (1994). Chowdhury, P., Long, A., Harris, G., Soulsby, M. E., Dobretsov, M. Animal model of simulated microgravity: a comparative study of hindlimb unloading via tail versus pelvic suspension. Physiological Reports. 1, (1), e00012 (2013). Morey, E. R., Sabelman, E. E., Turner, R. T., Baylink, D. J. A new rat model simulating some aspects of space flight. The Physiologist. 22, (6), S23-4 (1979). NASA. National Space Exploration Campaign Report. Available from: https://www.nasa.gov/sites/default/files/atoms/files/nationalspaceexplorationcampaign.pdf (2018). Mortreux, M., Nagy, J. A., Ko, F. C., Bouxsein, M. L., Rutkove, S. B. 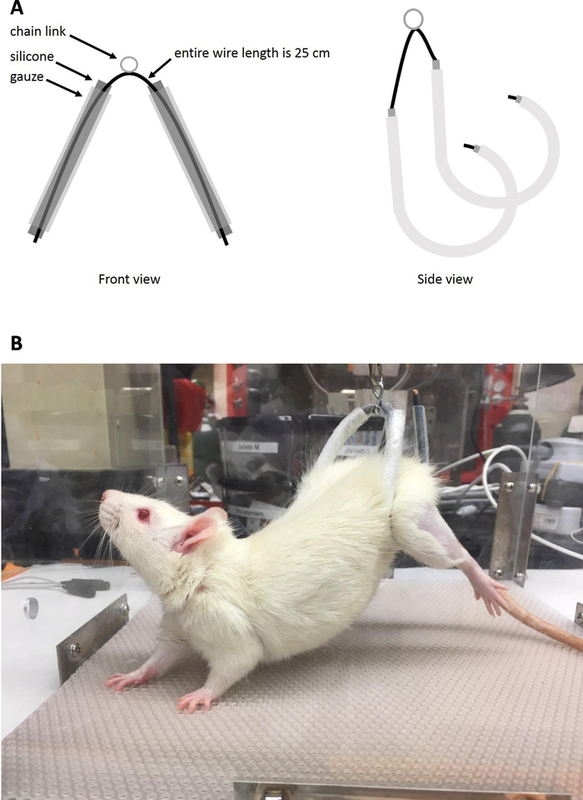 A novel partial gravity ground-based analogue for rats via quadrupedal unloading. Journal of Applied Physiology. 125, 175-182 (2018). Ellman, R., et al. Combined effects of botulinum toxin injection and hind limb unloading on bone and muscle. Calcified Tissue International. 94, (3), (2014). Swift, J. M., et al. Partial Weight Bearing Does Not Prevent Musculoskeletal Losses Associated with Disuse. Medicine & Science in Sports & Exercise. 45, (11), 2052-2060 (2013). Morey-Holton, E. R., Globus, R. K. Hindlimb unloading rodent model: technical aspects. Journal of Applied Physiology. 92, (4), 1367-1377 (2002). Andreev-Andrievskiy, A. A., Popova, A. S., Lagereva, E. A., Vinogradova, O. L. Fluid shift versus body size: changes of hematological parameters and body fluid volume in hindlimb-unloaded mice, rats and rabbits. Journal of Experimental Biology. 221, (Pt 17), (2018).